Where the weather is warm, boat sales have remained bright and, even though it was October, enough Americans were still buying that the industry reached double-digit percentage gains for the fourth month in a row. 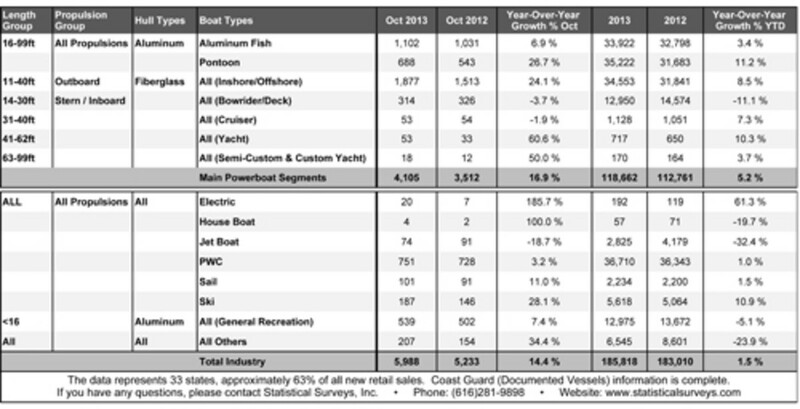 Sales in the main powerboat segments rose 16.9 percent, or 593 boats, to 4,105, and industrywide sales climbed 14.4 percent, or 755 boats, to 5,988, from October 2012 in 33 states that represent 63 percent of the national market, according to data compiled by Statistical Surveys. Two of the industry’s sales-leading categories — aluminum pontoons and 11- to 40-foot fiberglass outboards — posted gains of more than 20 percent. The outboard segment surged 24.1 percent, or 364 boats, to an industrywide high of 1,877 and, on a percentage basis, pontoon sales climbed an even higher 26.7 percent, or 145 boats, to 688. Sales of aluminum fishing boats, which have climbed in tandem with pontoons during the industry’s nearly two-year recovery from the Great Recession, rose 6.9 percent, or 71 boats, to 1,102. Sales of inboard and sterndrive boats of 14 to 30 feet fell by 3.7 percent, or 12, to 314. The category was the only one among the main segments’ higher-volume groups to report a drop in sales. Kloppe said the consistent growth the industry is starting to get is creating the kind of stability that gives builders and dealers more confidence about what to make and stock. Dealers he met this week at the Marine Dealer Conference & Expo in Orlando, Fla., told him they’re satisfied with their inventory levels. Kloppe said he thinks the industry will see small, but continued growth in November and December, which are traditionally slow sales months. Florida was the October leader at 1,577 boats, followed by Texas (819), South Carolina (374), Tennessee (358) and California (312). Rounding out the top 10 were North Carolina (287), Michigan (265), Georgia (257), Arizona (191) and New York (153). Florida (1,214), Texas (781) and South Carolina (330) also led the sales list in October last year, and each of those states said they had more sales this year. With 17 states left to report, the industry has a chance to surpass the 7,140 boats that were sold nationwide last October, a month that ended with Hurricane Sandy slamming into the East Coast, devastating marinas and boatyards. BoatUS estimated that Sandy damaged or destroyed 65,000 boats at a cost of roughly $650 million. For 2013 through October in the early-reporting states, sales were up 5.2 percent, or 5,901 boats, to 118,662, and industrywide they were up 1.5 percent, or 2,808 boats, to 185,818. The Coast Guard was up to date in its reports of documented vessels, giving a complete picture of sales in bigger-boat categories. Sales of 31- to 40-foot cruisers were nearly flat, at 53 boats, sales of 41- to 62-foot yachts rose by 20 to 53 and sales of 63- to 99-foot custom and semicustom yachts rose by six to 18. Sales of ski boats rose by 41 to 187 and sales of personal watercraft climbed by 23 units to 751. Jetboats, a category that is expected to rebound as more builders enter it, saw sales fall by 17 to 74. Jetboat sales are down 32.4 percent through October in the early-reporting states, a picture that Kloppe said should brighten next year as boats from Four Winns, Glastron and Chaparral enter the market. Sailboat sales rose by 10 to 101.